This weekend I needed a tasty simple lunch…and since its fall weather out there it needs to be warm. So I whipped this together. It’s based on something my uncle used to make while babysitting my sisters and I all those years ago. A delicious and comforting dish that can be made with any cold cuts really. So quick it doesn’t leave the raid waiting too long for its healer hehe. While it is a fast healthy alternative to fast food I would still classify this as a lunch to be indulged in only on occasion as it still has quite a bit of fat in it. Cut the bagel in half and spray lightly with cooking spray. Place under broiler until lightly toasted. 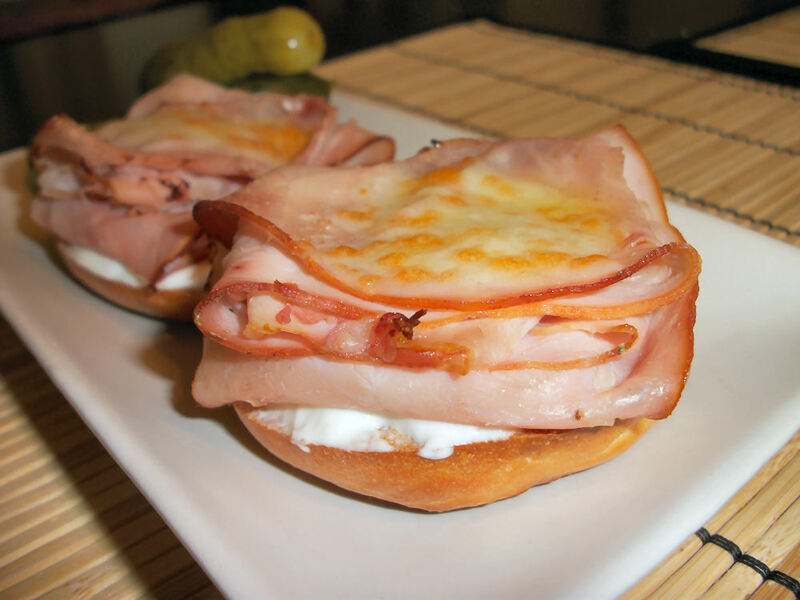 Top the toasted bagel half with equal portions of ham and cheese. Place under the broiler again until the cheese melts and browns. Gently remove the meat and cheese, it tends to move as one unit for me, top the bagel with tzatziki and lettuce. Replace the meat and cheese on top of the lettuce. Serve! I suggest serving this with a couple of dill pickles to complete that deli sandwich num! This dish serves one. It contains 235 calories, 9 grams of fat, and 1 gram of fibre. Like I said the fat is not fabulous to lower it even further I suggest experimenting with other lower milk fat cheeses and lean chicken cold cuts. Also a very tasty toasty. Great for gaming on a rainy day. Enjoy! This entry was posted in Comfort Foods, Lunch and tagged Bread, Cheese, Pork. Bookmark the permalink.